WordPress is an open source website creation tool written in PHP. But in non-geek speak, it’s probably the easiest and most powerful blogging and website content management system (or CMS) in existence today. There are nearly 75 million websites around the world powered by WordPress, which equals nearly 20% of all websites on the Web. 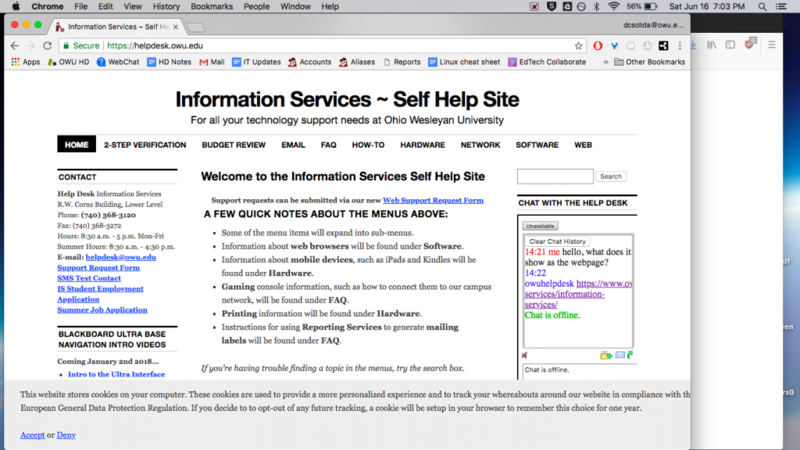 OWU WordPress is our multi-site WordPress server for the entire campus community. See below for a list of some of the sites we host. 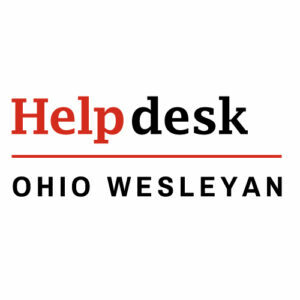 If you would like a blog or a website for your course, club, or department, or a professional website of your own, contact the Help Desk to discuss your options. Below is some helpful information for those considering starting a site, and for those who already have one. WordPress Release 4.9.6 was installed on our servers on Tuesday, June 19. It includes privacy features designed to comply with the European Union’s General Data Protection Regulations (GDPR) that took effect on May 25. The GDPR requires website owners to be transparent about how they collect, use, and share personal data. It also requires that site visitors have more access and choice when it comes to how their own personal data is collected, used, and shared. You will only need to take action if you have comments enabled and/or you’re using any web form on your site. In other words, if you’re not collecting any site visitor’s personal data, this message is for your cognizance and future reference only. A Theme is a collection of files that work together to produce a graphical front-end interface with a unifying design for a site. It modifies the way the site is displayed–the look & feel, without modifying the underlying core programming of WordPress. All themes for OWU have been customized for single-sign-on, and may have other local customizations. You don’t necessarily have to choose one of our pre-installed themes. There are thousands of themes available in the official WordPress Theme Directory, and many more available directly from theme developers. And here’s a good article from WP Beginner on Selecting the Perfect WordPress Theme – 9 Things You Should Consider. We’re also happy to consult with site admins on finding a good theme for your site. Adventurous- Adventurous is a Simple, Clean, Minimal, Lightweight, Box-Shaped and Full-Width Responsive WordPress Theme. Another Twenty Sixteen child theme for OWU- Twenty Sixteen is a modernized take on an ever-popular WordPress layout — the horizontal masthead with an optional right sidebar that works perfectly for blogs and websites. Awaken- Awaken WordPress theme is an elegant magazine/news WordPress theme. Book Blog- Variable grid layout, easing effect on window resizing. Cassions- Cassions is a clean, simple responsive magazine theme for WordPress. Catch Kathmandu- Catch Kathmandu Theme is a fully responsive WordPress theme that looks elegant on any devices. It is simple, clean and lightweight. Clean Education- the free Education WordPress theme portrays your education website as simple, clean and user-friendly. Coraline- A squeaky-clean theme featuring a custom menu, header, background, and layout. Coraline supports 7 widget areas and featured images. Customizr- Customizr is a versatile and easy to customize WordPress theme, instantly giving a professional look to your online presence. Designed with visitor engagement in mind, it allows anyone to create a beautiful, fast and mobile friendly website compatible with all browsers and devices. Daily Insight- a news and magazine WordPress free theme which can transform your blog into a modern online magazine. Dyad- Dyad pairs your written content and images together in perfect balance. The theme is geared towards photographers, foodies, artists, and anyone who is looking for a strong photographic presence on their website. Eighties- A modern, progressively enhanced theme designed to keep your content front and center. Enigma- Enigma is an incredibly superfine multipurpose responsive theme you can use for your business, portfolio, blogging or any type of site. Enigma is Responsive and flexible based on a framework that adapts your website to mobile devices and the desktop or any other viewing environment. IMPORTANT: To get Theme Updates, I strongly recommend you sign up for a Theme Membership at Pixel Theme Studio. Magazine Premium- Create a truly unique design using the theme customizer by choosing your own header image, background color or image, page layout, site width, link color and more. Distinguish each post with one of the eight supported post formats: Video, Image, Aside, Status, Audio, Quote, Link and Gallery. News Mix Lite- designed for magazine, news with flexible layout. Oblique- a creative masonry theme that works great for fashion or general bloggers. Omega- a responsive WordPress theme framework, serving as a robust WordPress Parent Theme. P2- Blogging at the speed of thought. P2 transforms a mild-mannered blog into a super-blog with features like inline comments, a posting form right on the homepage, inline editing of posts and comments, real-time updates, and much more. Promenade- Featuring a widgetized homepage, Promenade’s clean layout and minimalistic design is perfect to capture your audience’s attention and allow them to easily navigate your content. Snowblind- Create a truly unique design with Snowblind, a lightweight and fully responsive theme. Use the new Theme Options customizer to add your own background, page layout, site width and more. Distinguish each post with one of the eight supported post formats: Video, Image, Aside, Status, Audio, Quote, Link and Gallery. Spacious- Spacious is an incredibly spacious multipurpose responsive theme coded & designed with a lot of care and love. You can use it for your business, portfolio, blogging or any type of site. Suffusion- An elegant, responsive and versatile theme with a power-packed set of options. It supports Mega-Menus, custom layout templates, advanced support for custom post types, customizable drop-down menus, featured sliders, tabbed sidebars, a magazine layout and lots of enhanced widgets for Twitter, Flickr, Google etc. Twenty Eleven- The 2011 theme for WordPress is sophisticated, lightweight, and adaptable. Make it yours with a custom menu, header image, and background — then go further with available theme options for light or dark color scheme, custom link colors, and three layout choices. Twenty Twelve- The 2012 theme for WordPress is a fully responsive theme that looks great on any device. Features include a front page template with its own widgets, an optional display font, styling for post formats on both index and single views, and an optional no-sidebar page template. Twenty Thirteen- The 2013 theme for WordPress takes us back to the blog, featuring a full range of post formats, each displayed beautifully in their own unique way. Design details abound, starting with a vibrant color scheme and matching header images, beautiful typography and icons, and a flexible layout that looks great on any device, big or small. Twenty Fourteen- In 2014, our default theme lets you create a responsive magazine website with a sleek, modern design. Twenty Fifteen- Our 2015 default theme is clean, blog-focused, and designed for clarity. Twenty Fifteen’s simple, straightforward typography is readable on a wide variety of screen sizes, and suitable for multiple languages. Twenty Sixteen- Twenty Sixteen is a modernized take on an ever-popular WordPress layout — the horizontal masthead with an optional right sidebar that works perfectly for blogs and websites. Twenty Seventeen- Twenty Seventeen brings your site to life with header video and immersive featured images. Plugins extend and expand the functionality of WordPress. There are over 46,ooo plugins with more than 1 billion total downloads at the WordPress.org Plugin Directory. Below is what’s already installed and available on OWU WordPress. Users with the Admin role will have access to see the list and enable/disable plugins on their sites. Some plugins are network activated, which means they’re enabled on all sites by default. Other plugins, such as Shibboleth or Simple LDAP Login, are activated on each site when we create them, and should not be disabled. Let us know if you have any questions. Would you like a new plugin for your site? Just let us know, and we’ll check it out. It may be that the functionality you’re looking for is already available. Click here for the list of network activated plugins. Activity Log – Be aware of any and all activities taking place on your site. Akismet Anti-Spam – Spam comment protection. AP Extended Mime Types – Extends the allowed uploadable file types to include a wide range of file formats. Feed Thumbnails – Adds your post images as thumbnails to your feed (RSS) enclosures. 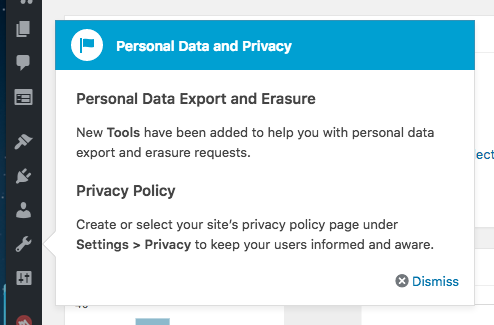 More Privacy Options – Add more privacy/visibility options to a WordPress multisite network. Multisite Enhancements – Various tweaks for network admins. Network Username Restrictions Override – Override some of the built-in restrictions in WordPress network usernames. NS Cloner – Site Copier – Creates a new site as an exact clone / duplicate / copy of an existing site with theme and all plugins and settings intact in just a few steps. Regenerate Thumbnails – Allows you to regenerate all thumbnails after changing the thumbnail sizes. SSH SFTP Updater Support – Update your WordPress blog / plugins via SFTP for greater security. TinyMCE Advanced – Enables advanced features and plugins in the visual editor in WordPress. Widget Importer & Exporter – Import posts, pages, comments, custom fields, categories, tags and more in a WordPress export file. WordPress MU Domain Mapping – Map any blog on a WordPress website to another domain. WP Security Audit Log – Keep track of everything happening on your WordPress including WordPress users activity. WP Super Cache – Very fast caching plugin for WordPress. Get aware of any activities that are taking place on your dashboard! Imagine it like a black-box for your WordPress site. e.g. post was deleted, plugin was activated, user logged in or logged out - it's all these for you to see. Collapse-O-Matic adds an [expand] shortcode that wraps content into a lovely, jQuery collapsible div. Adds settings export and import functionality to the WordPress customizer. Provides a checkbox on the editing page which you can check to exclude pages from the primary navigation. IMPORTANT NOTE: This will remove the pages from any "consumer" side page listings, which may not be limited to your page navigation listings. Hummingbird zips through your site finding new ways to make it load faster, from file compression and minification to browser caching – because when it comes to pagespeed, every millisecond counts. Create a list of the active plugins in a page (when the shortcode [list_plugins] is found). a link to download the zip file of the current version. Plugin developped from the orginal plugin WP-PluginsUsed. This plugin is under GPL licence. Add controls for table editing to the visual content editor with this light weight plug-in. Override some of the built-in restrictions in WordPress network usernames. Similar to the Blog Name Restrictions Override plugin. A simple plugin that allows the user to assign categories and tags to pages. The amazing NS Cloner creates a new site as an exact clone / duplicate / copy of an existing site with theme and all plugins and settings intact in just a few steps. Check out NS Cloner Pro for additional powerful add-ons and features! Opens all external links in a new window. XHTML Strict compliant and search engine optimized (SEO). Allows you to point WordPress pages or posts to a URL of your choosing. Good for setting up navigational links to non-WP sections of your site or to off-site resources. Regenerate the thumbnails for one or more of your image uploads. Useful when changing their sizes or your theme. by Clif Griffin Development Inc. Enables advanced features and plugins in TinyMCE, the visual editor in WordPress. VFB Pro is the easiest form builder on the market. The easiest way to Add Widgets or Sidebars to Posts and Pages using shortcodes or template tags. Import posts, pages, comments, custom fields, categories, tags and more from a WordPress export file. Map any blog on a WordPress website to another domain. Check and manage HTTP response codes of all your content site links and images. Specify custom links for WordPress gallery images (instead of attachment or file only). Identify WordPress security issues before they become a problem. Keep track of everything happening on your WordPress including WordPress users activity. Similar to Windows Event Log and Linux Syslog, WP Security Audit Log generates a security alert for everything that happens on your WordPress blogs and websites. Use the Audit Log Viewer included in the plugin to see all the security alerts. The OWU WordPress 2 server, and all of its files, are part of our network backup service, and can be restored up to 30 days back. Once you’ve answered the math problem and signed in, (you must have administrator access to do this,) hover over Jetpack on the left and click on Settings. In the list of settings, look for Protect, and click the Configure link that appears when you hover over it. Enter your computer’s IP address in the box, and click Save. That should make it easier to sign in next time.